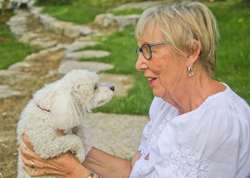 Ample research shows pet ownership delivers physical and mental health benefits for seniors, regardless of whether they’re living on their own or in a senior living community. However, many older Americans still mistakenly believe moving into a senior living community means they’ll have to leave their pets behind. In fact, the fear they’ll have to give up a beloved pet is among the top emotional reasons seniors don’t want to move into senior living, according to author and senior real estate specialist Bruce Nemovitz. In an informal survey (1) by Nemovitz, seniors ranked losing a pet as emotionally jarring as having to leave their familiar homes and possessions. Pet ownership benefits senior citizens in multiple ways, research shows. Older people who own dogs are likely to spend 22 additional minutes walking at a moderately intense pace each day, according to a recent study by The University of Lincoln and Glasgow Caledonian University. Published in BioMed Central (2), the study also found dog owners took more than 2,700 more steps per day than non-owners. The online journal Current Gerontology and Geriatrics Research (3) reports multiple studies indicate dementia patients who interact with animals become more social, are less agitated and have fewer behavioral issues. What, if any, kind of training do you require pets to have? Requiring dogs to be house-trained and cats to be litter-trained is standard. Communities will also want to know your pet is well-behaved and not aggressive. They may ask you to have pets obedience trained. Do you offer any assistance with pet-related tasks? Most communities will require residents be able to care for pets themselves, including feeding, walking, potty needs and health needs.